Bottom line: Only audio could be recorded. There may be other sources for the audio. But I have posted it below in 5 segments to meet Yahoo-video limitations. (Audio with a still picture.) You won't find any gaffes. My guess is that the polls - which show the two candidates in a tie (with maybe a slight edge for Brown) - won't be budged. If you have followed past posts on this blog regarding the public pension issue, neither candidate deviated from past statements. Brown claimed credit for the two-tier idea which he says he advocated (but did not get) in 1982. Whitman pushed for defined-contribution pension plans for new hires. Brown was asked if he would roll back higher ed tuition increases and said he couldn't in the current budget environment but would like to see the increases halt. Whitman repeated the idea of transferring a billion dollars to higher ed from cuts elsewhere, apparently "welfare." Comment from yours truly: Maybe the definition of insanity is repeating Einstein's quote about it over and over again and expecting different polling results. Could it be that these two republican women are falling in the polls because they look better on paper than in real life or are people finding out who they real are? Lets face it Carly Fiorina was basically fired from HP, but not before she sent HP USA jobs overseas. California has already tried a so-called outsider Independent Republican, his name Arnold Schwarzenegger, we all know how that turned out. 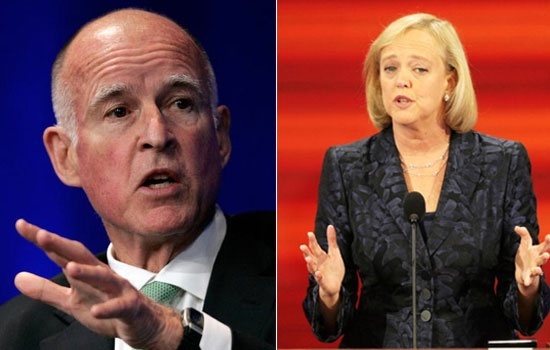 Meg Whitman, thinks she can buy the election, but what puzzles many is if she real cared and loved California then why not do your civil duty and vote, seems she is more rhetoric than anything (in good times we would give her a try but not in our disaster mode that we are in). She is finding out that California is not for sale and that you can’t buy everything! What a waste of money!